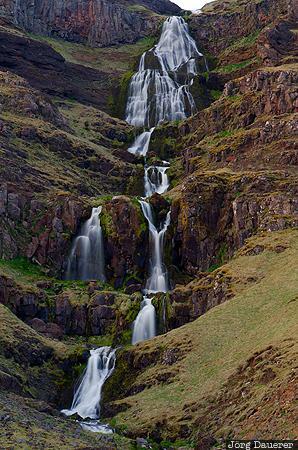 A multi stage waterfall near Olafsvik in the north of the Snæfellsnes peninsula. The Snæfellsnes Peninsula is in Vesturland in the west of Iceland. This photo was taken in the very early morning in June of 2012 before the rise of the midnight sun. This photo is part of the exhibition Waterfalls of Northern Europe (Oct'14). This photo was taken with a digital camera.